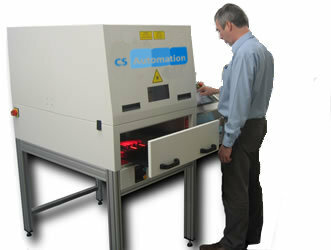 This image shows one of our standard manual laser enclosure models. On this particular project our customer wanted to use a CO2 laser to permanently mark industrial electrical connectors. The fixture can be removed from the drawer which gives the customer the flexibility of fast changeovers for different product types. Our client wanted to automatically feed jedec trays past a laser, marking all devices on the tray. "Through the lens" vision is used to locate the bottom line of pre-printed text. The derived position is used to drive the laser to mark the device in a designated position. Laser marking is fast, flexible and permanent and produces high quality results. Lasers can mark most materials including metal, plastic, ceramics and organic material. The laser can be used to mark products with information such as logos, symbols, barcodes, alphanumeric text and 2D machine readable codes. At CS Automation we have established relationships with various laser suppliers and can offer appropriate solutions for our customers’ marking requirements. 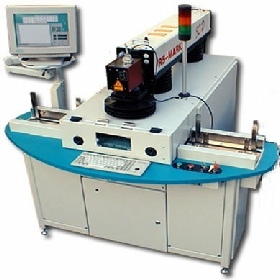 The laser can be integrated into a bespoke manual workstation, a fully automated handling system or a process such as an assembly or inspection machine.